This is Audi Queens. This is The Difference. Audi Queens is ready to serve the greater New York City area with exceptional experiences. Our team members treat every person with integrity and respect and we continually strive to become the premier Audi dealership. Audi Queens’ transparent interactions, data-driven pricing and direct communication delivers customers a superior shopping environment—one that is fitting a high-quality, luxury vehicle. We understand that evolution in the industry is inevitable and embrace technology and progressive thinking. We aim to provide customers with as much information as possible because we feel it’s a necessary component to making a secure and comfortable decision. Our entire staff recognizes the value and pride of offering authentic and sincere service to customers. The dedicated teams here create an unsurpassed atmosphere of integrity and ease. Come to Audi Queens and experience higher standards. 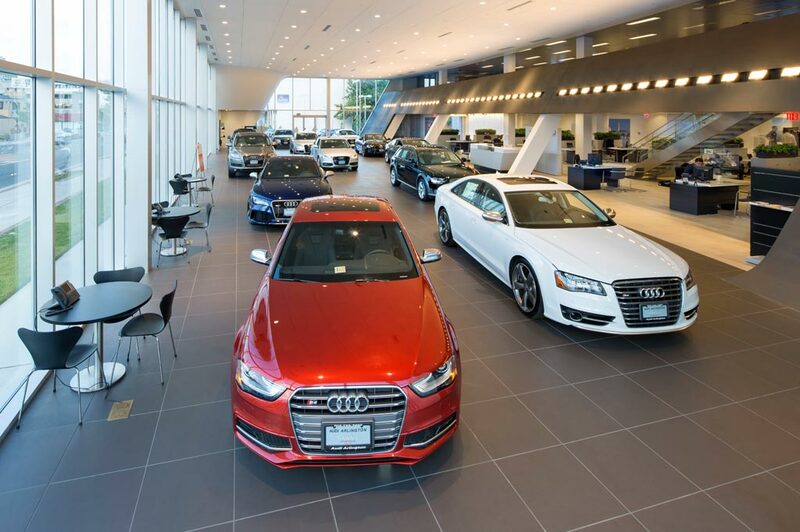 Audi Queens built a stunning showroom that showcases some of the best inventory in the tri-state area. As a new automotive dealership serving the greater New York City area, our focus is to delight customers through exceptional experiences. Audi Queens is focused on developing a clear, customer-centric experience that integrates the latest technology with a robust inventory selection. It goes without saying that there should be a better way to buy a Pre-Owned vehicle. One where a dealership provides you with accurate information and straightforward advice. One where the process is simple, fair and consistent. That’s why Audi Queens created OnePrice Solution. With OnePrice Solution the process is fully transparent. Audi Queens gives you OnePrice Solution. Transparent. Data Driven. Direct. When it comes time to service your Audi, Audi Queens is the superior choice. Our team provides a consistent luxury experience with data-driven and transparent interactions. We first examine your vehicle and take photos to provide you with peace of mind. We then do a complimentary inspection of your tires and vehicle alignment—the two most underappreciated safety items! Then you’ll check in with one of our trained Service Concierges who are there to listen to your needs and concerns. The more you tell them the more they can help. Once our Audi-Certified technicians have diagnosed your vehicle, we immediately text or email you a FixedPrice Estimate—one that you can even approve via text message if you’d like. Ask today, ask tomorrow. With the Audi Queens’ FixedPrice Estimate, we use a pricing guide to guarantee that you’re always quoted the same amount. Ever wonder when is the best time to trade in your car? Or if you can get out of your lease early? To answer these and other questions, Audi Queens created the Actyve Upgrade Program. We use proprietary software that allows us to actively monitor whether you’re close to exceeding your allotted mileage, when you’re about to go out of warranty, if your contract is coming to an end, if your interest rate can be lowered, and most importantly, if you can get into a newer car at a similar payment to what you’re paying now. Audi Queens wants to make the car-buying process simple. With data-rich resources, we can actively provide you with amazing opportunities. As long as you service your vehicle with us and provide accurate information on your loan, we will do our best to save you hundreds, if not thousands of dollars. There is a better way to own an Audi and it’s through the Actyve Upgrade Program. Audi Queens in Flushing, NY treats the needs of each individual customer with paramount concern. We know that you have high expectations, and as a car dealer we enjoy the challenge of meeting and exceeding those standards each and every time. Allow us to demonstrate our commitment to excellence! Our experienced sales staff is eager to share its knowledge and enthusiasm with you. We encourage you to browse our online inventory, schedule a test drive and investigate financing options. You can also request more information about a vehicle using our online form or by calling 929-297-0700.